The objective of this article is to compare the legacy Large OBject (LOB) data type TEXT and the Sql Server 2005 introduced VARCHAR(MAX) LOB data type. It is a Non-Unicode large Variable Length character data type, which can store maximum of 2147483647 Non-Unicode characters (i.e. maximum storage capacity is: 2GB). 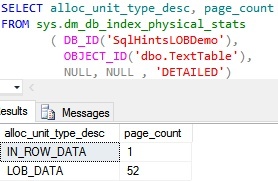 Text data type was present from the very old versions of Sql Server. If I remember correctly it was present even in Sql Server 6.5 days. VarChar(Max) data type was introduced in Sql Server 2005. As per MSDN link Microfost is suggesting to avoid using the Text datatype and it will be removed in a future versions of Sql Server. Varchar(Max) is the suggested data type for storing the large string values instead of Text data type. Data of a Text type column is stored out-of-row in a separate LOB data pages. The row in the table data page will only have a 16 byte pointer to the LOB data page where the actual data is present. Data of a Varchar(max) type column is stored in-row if it is less than or equal to 8000 byte. If Varchar(max) column value is crossing the 8000 bytes then the Varchar(max) column value is stored in a separate LOB data pages and row will only have a 16 byte pointer to the LOB data page where the actual data is present. When LOB column value is less than 8000 bytes or available space in the row, then whether LOB column value is stored in-row or out-of-row? Execute the following script to create a demo database SqlHintsLOBDemo if it doesn’t exists already. In the demo data base it creates a table TextTable with a Text LOB type column LargeString. Finally it inserts 100 records, where LargeString column value in each row is 4000 B characters (i.e. 4000 bytes). 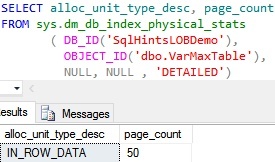 From the above result we can see that even though one row (4 Byte for Integer Id column value + 4000 Bytes for Text type column value) can fit into one 8KB data page, but still as per design Sql Server always stores the Text type column value in the LOB data pages. 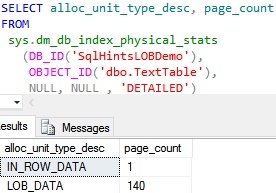 Whether we are storing 1 byte or 2GB data in a Text type column Sql Server always stores the Text type column value out-of-row in the LOB data pages and the row will have a 16 byte pointer pointing to the LOB data pages where the data is stored. Execute the following script to create a demo database SqlHintsLOBDemo if it doesn’t exists already. In the demo data base it creates a table VarMaxTable with a VarChar(Max) LOB type column LargeString. Finally it inserts 100 records, where LargeString column value in each row is 4000 B characters (i.e. 4000 bytes). From the above result we can see that LOB VarChar(MAX) type column value is stored in-row. For VarChar(MAX) type column Sql Server by default always tries to store the data in-row. Only if it is exceeding 8000 bytes or available space in the row, then only it stores out-of-row in a LOB data pages and in-row it will have 16 byte pointer to the LOB data pages where actual column value is stored. When LOB column value is more than 8000 bytes or available space in the row, then whether LOB column value is stored in-row or out-of-row? Execute the following script to remove the previously inserted records and insert 100 records where LargeString column value in each row is 10,000 B characters (i.e. 10,000 bytes). The above result further re-affirms that: whether we are storing 1 byte or 2GB data in a Text type column Sql Server always stores the Text type column value out-of-row in the LOB data pages and the row will have a 16 byte pointer pointing to the LOB data pages where the data is stored. From the above result we can see that LOB VarChar(MAX) type column value is stored out-of-row in a LOB data pages. For VarChar(MAX) type column Sql Server by default always tries to store the data in-row. Only if it is exceeding 8000 bytes or available space in the row, then only it stores out-of-row in a LOB data pages having 16 byte pointer in-row pointing to LOB data pages where actual column value is stored. Do we have an option to change default In-Row and Out-Of-Row Storage behavior? 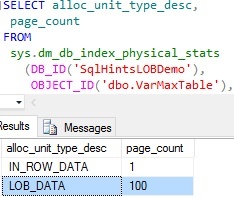 As we have already seen above whether we are storing 1 byte or 2GB data in a Text type column Sql Server always stores it out-of-row in the LOB data pages and the row will have a 16 byte pointer pointing to the LOB data pages where the data is stored. 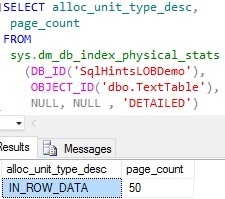 Sql Server provides a mechanism where we can change this default behavior of storing the data out-of-row even when we have a sufficient free space in the row to accommodate the Text type column value, by means of sp_tableoption system stored procedure with the option ‘text in row’. Execute the below statement to store the Text Type Column value in Row if Text Type column value is less than 7000 bytes or enough space is available in the row. integer value from 24 through 7000: specifies the number bytes up to which the text type column value is stored in-row. Execute the following script to remove the previously inserted records and insert 100 records where LargeString column value in each row is 4,000 ‘B’ characters (i.e. 4,000 bytes). From the above result now we can see that the Text column values are stored in-row. So we can use sp_tableoption system stored procedures option ‘text in row’ to change the text data types default storage behavior of always storing out-of-row. With this option we an force text data type column value to store in-row up-to 7000 bytes or till the enough space is available in the row. Execute the following statement to change back the Text type columns storage behavior to the default behavior where Text type columns values are always stored out-of-row even we have sufficient space in the row. As we have already seen above for VarChar(MAX) type column Sql Server by default always tries to store the data in-row. Only if it is exceeding 8000 bytes or available space in the row, then only it stores out-of-row in a LOB data pages and in-row it will have 16 byte pointer to the LOB data pages where actual column value is stored. 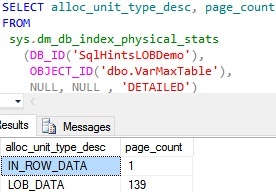 Sql Server provides a mechanism where we can change this default behavior of storing the data for VarChar(Max) type column, by means of sp_tableoption system stored procedure with the option ‘large value types out of row’. Execute the below statement to always store Varchar(Max) column value out-of-Row whether it is 1 byte or 2GB even when enough space is available in the row. 0 (Default) : Varchar(Max) column values are stored in-row as long as the value length is <= 8000 bytes and enough space is available in the row. 1 : VarChar(Max) column values are always stored out-of-row even when enough space is available in the row. From the above result we can see that VarChar(Max) type column values are stored out-of-row even when there was a sufficient space available in the row. So we can use the sp_tableoption system stored procedures option ‘large value types out of row’ to change the Varchar(Max) data type columns default storage behavior. Execute the following statement to change back the Varchar(Max) type columns storage behavior to the default behavior where Sql Server by default always tries to store the data in-row. Only if it is exceeding 8000 bytes or available space in the row, then only it stores out-of-row in a LOB data pages. Some of the string functions, operators or the constructs which work on VarChar(Max) type column may not work on the Text type column. From the above examples we can see that we can’t use ‘=’ operator on a Text type column and also the Group By clause on the Text type column. Some of the string functions, operators or the constructs which doesn’t work on the Text type column, but they do work on VarChar(Max) type column. From the above examples we can see that we use ‘=’ operator and Group By clause on the VarChar(Max) type column, but not on the Text type column. If data stored in the Varchar(Max) column is a very large strings, then using these functions may lead to performance issues. As we know that the Text type column values are always stored out-of-row in LOB data pages and in-row it will have a 16 byte pointer pointing to the root LOB data page. So if the query doesn’t include the LOB columns then the number of pages required to read to retrieve the data will be less as the column data is out-of-row. But if the query includes the LOB columns, then the number of pages required to retrieve the data will be more. As we know that the VarChar(Max) type column values are stored out-of-row only if the length of the value to be stored in it is greater than 8000 bytes or there is not enough space in the row, otherwise it will store it in-row. So if most of the values stored in the VarChar(Max) column are large and stored out-of-row, the data retrieval behavior will almost similar to the one that of the Text type column. But if most of the values stored in VarChar(Max) type columns are small enough to store in-row. Then retrieval of the data where LOB columns are not included requires the more number of data pages to read as the LOB column value is stored in-row in the same data page where the non-LOB column values are stored. But if the select query includes LOB column then it requires less number of pages to read for the data retrieval compared to the Text type columns.